Welcome to Heart Rock Bison. We are an American owned and operated ranch and have been raising buffalo since 2000. 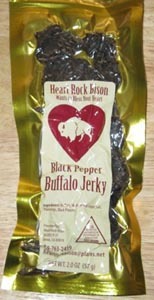 Besides our love for the buffalo itself, we also raise buffalo for the meat, both for the freezer and in jerky form. It's . . . .
For Everyone - Tastes Great!